I am an old collector, G1 Bowtie is my favourite. I am wanting to cull the herd as a lot are wasted in storage and a few I am thinking of selling to help buy a present for my husband. But since I haven't paid attention for about a decade I have no idea on values! Hi! We will be be more than welcome to give you some price checks! I have never seen another mib spanish baby bowtie so I have never known it's value. Perhaps another has come up in the years I haven't paid attention. Great to have you. I keep thinking I will thin my G1's but I can't seem to part with them and I don't have room for all of them. It is making my head spin in circles. I think I will just sell my extras. Here is a completed auction on what that shows the ending price. Is this the version you have? They usually sell between 25-35 dollars depending on demand. If yours is in the box I am at a loss. 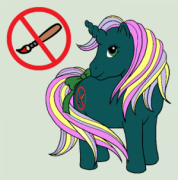 You will need to post in the MLP forum or even the Nirvana variant section for help with that one. Hi Spootiepatootie! Welcome to the Trading Post. You'll definitely like it here. Tula - that's the one I think it's a cutie (my favourite baby pose). Hullo and welcome! What an adorable name you picked. I love it!